Now that the OHL Championship round is set and many NHL fan bases are into their offseason, there might be some fans that are starting to check in on prospect and draft coverage. With that in mind, here are some things to look for while watching the Erie Otters go up against the Mississauga Steelheads for a chance to play in the 99th Memorial Cup. After a horrendous start to the season, the Steelheads have been one of the best teams in the CHL from the time Spencer Watson and Vili Saarijarvi returned to the lineup in December. With a record of 8-1, the Trout steamrolled through Oshawa and Peterborough in the last two rounds. They have a high-powered offense and a defence core that has been second to none in these playoffs. Watson and the McLeod brothers have been on fire. For a team that lacks depth up front, the Steelheads will rely on their top two lines to carry the load again is they’re going to have and chance against the Otters. The big question will be whether or not the goaltending for the Steelheads can stand up to the elite scorers in Erie. Jacob Ingham has had a very good rookie season between the pipes for Mississauga, but he has been replaced by veteran Matthew Mancina during the majority of the playoffs. Both have been battling through injuries over the past few weeks and it wouldn’t be surprising to see both get into games during the championship round. Then there are the Super Buddies – New Jersey Devils prospects and best friends. Michael McLeod and Nathan Bastian have been split up and each has been playing center for one the Mississauga’s top-2 lines. Playing with Spencer Watson, McLeod has been outstanding these playoffs, carrying the offensive load with 25 points in only 15 games – all while his little brother Ryan (2018 NHL Draft eligible) rides shotgun. Bastian hasn’t taken the steps Devils fans probably would have liked to see this season, but he has been decent on the second line. He and trade deadline addition Trent Fox have done a good job of providing secondary scoring behind the big guys. The Western Conference champions are one series away from the culmination of the three-year journey. With their stars Dylan Strome, Alex DeBrincat and the Raddysh brothers set to move on next season, the Otters went all in at the trade deadline. Bringing in Anthony Cirelli from Oshawa and Warren Foegele from Kingston, the Otters added top-end forwards that give them two of the best lines in all of junior hockey. From the time he returned from the NHL, Dylan Strome has played the best hockey of his career. Putting up more than two points per game in the regular season, and leading Canada in scoring at the World Juniors, Strome has shown why he is one of the best prospects in all of hockey. As the possession driver between DeBrincat and Taylor Raddysh, Strome will likely get a large dose of Mickey McLeod this round. In 2015, Anthony Cirelli was a walk-on rookie that went from playing on the fourth line to scoring the Memorial Cup winning goal for the Oshawa Generals. This year, Cirelli is the two-way veteran that has been counted on to provide the secondary scoring and leadership that the Erie was lacking last season. 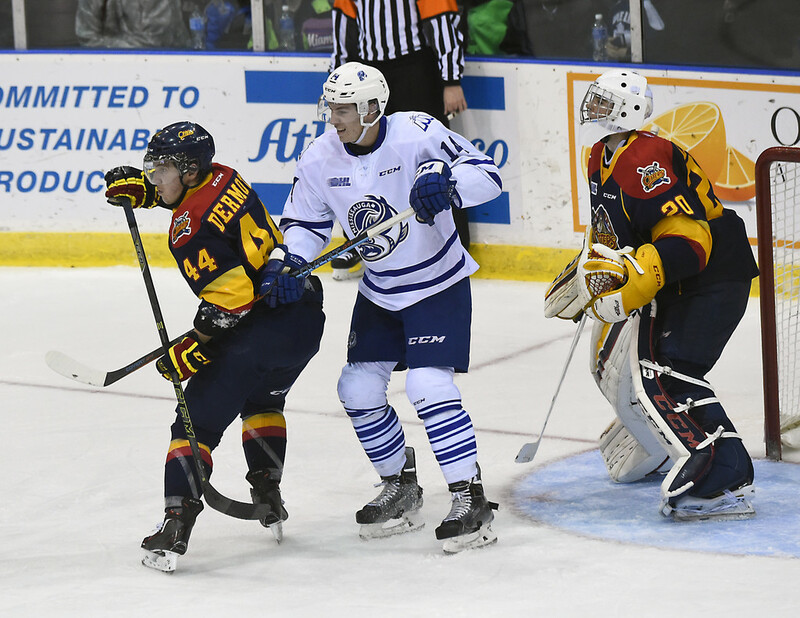 Like with Mississauga, Erie’s undisputed weakness is in net. Troy Timpano has not been good for the Otters – he’s cost them a couple of games already these playoffs. Former Steelhead Joseph Murdaca has been better but Erie seems hell bent on living or dying on the play of Timpano. For those interested in watching the series to gain a little perspective on this June’s NHL Entry Draft, the two big names to watch are defenseman Nic Hague and winger Owen Tippett both playing for Mississauga. Hague is a big (6’6) strong defender that is very good at both ends of the rink. He’s got a shot that is already NHL ready and has become a legitimate threat to score on every powerplay. He skates very well for his size and has no problem leading the breakout or adding pressure for an odd man rush. In his own end, Hague is strong and physical. He uses his huge reach to compensate for positioning gaffes and has improved with his gap control and decision making as the season has gone on. He’s not the most natural defender, as Hague’s decision making and instincts leave a lot to be desired. He’s got the physical tools to be a high-end NHL defender but might lake the hockey IQ to ever get there. He has been known to have mental lapses – both defensively and from a discipline perspective – that often hurt his team. Hague has fallen down the draft boards this season, but I’d still expect him to be drafted in the middle portion of the first round. Hague’s teammate, Owen Tippett has spent this year showing that he is one of the most offensively gifted players in the OHL. With 44 goals this season, Tippett is a pure sniper that will likely be a wonderful compliment in the NHL. His game is built around the simple premise of ‘skate fast and shoot the puck’ – not dissimilar to Phil Kessel. Tippett is going to have to learn to do more when his line isn’t in an offensive position. likely his major flaw is that Tippett has the tendency to let opponent (and officials) get under his skin and throw him off his game. He will certainly be drafted in the top-10 and it’s not inconceivable to think that Tippett could be drafted 3rd overall. He’ll never be a team’s best player but he’s good enough to be a scoring focused top-6 winger at the NHL level. The third player in this series that should be watched closely for those interested in the draft is Ivan Lodnia on Erie. The right winger had a slow start to the season but was one of Eries best players down the stretch. Lodnia is one of the most naturally gifted players in the OHL. He has all the pure skill of a guy like Mitch Marner or Max Domi and if he can ever put it all together, watch out – Lodnia could turn into a star. He’s a quick player that wants the puck on his stick. He works well off of the rush and is able to create scoring chances both for himself and his linemates. He’s had a rough postseason and that could hurt his draft stock, but for a team holding one of the first few picks in the second round, they could end up getting a steal if they can draft Lodnia. Though not the deepest of prospect pools, this series will feature a couple of the highlights of the Detroit Red Wings system. Two of the more under-appreciated players in this series are Jordan Sambrook on Erie and Villi Saarijavi on Mississauga and both are defensive prospects for Detroit. Sambrook is a big, smooth-skating right-shot defenseman that was selected in the 5th round last June. He took a big step this season, showing an offensive side to his game to go along with the calmness and poise that he shows on the defensive side of the puck. Sambrook plays with a simplicity to his game that will not turn heads, but he’s exactly the kind of defender that can play in every situation and be trusted by his coach to log big minutes. Going into last year’s draft I had mentioned Sambrook as a potential late round steal and through one season, he’s looking to be just that. On the other side of the ice, Vili Saarijarvi is a guy with legitimate star potential. After being acquired from Flint in the offseason, Saarijarvi needed time to recover from injuries and get back into the lineup regularly. Once he was there, he became Mississauga’s best defender and quite possibly their best player. Averaging almost a point per game from the blue line, the right-handed defenseman proved this season that he has the potential to be an elite puck-mover at the next level. As good as he was in the regular season, Saarijarvi has been even better in the playoffs. With 14 points through 15 games, he has been one of the key reasons why Mississauga has looked so dominant thus far. There’s no doubt that he’s ready to play professional hockey, it’s just a matter of how quickly he ends up getting into the Red Wings lineup. Before the playoffs started, I chose the Mississauga Steelheads to win the J. Ross Robertson Cup to represent the OHL at the Memorial Cup at the end of May – I won’t change that now. Erie will be the favourite going into the series, but they have had a much harder road to get there and I think that their goaltending will ultimately be their undoing. Give me the Steelheads in 6.